3/26 New Things Challenge: Drink a whole bucket of Slurpee! 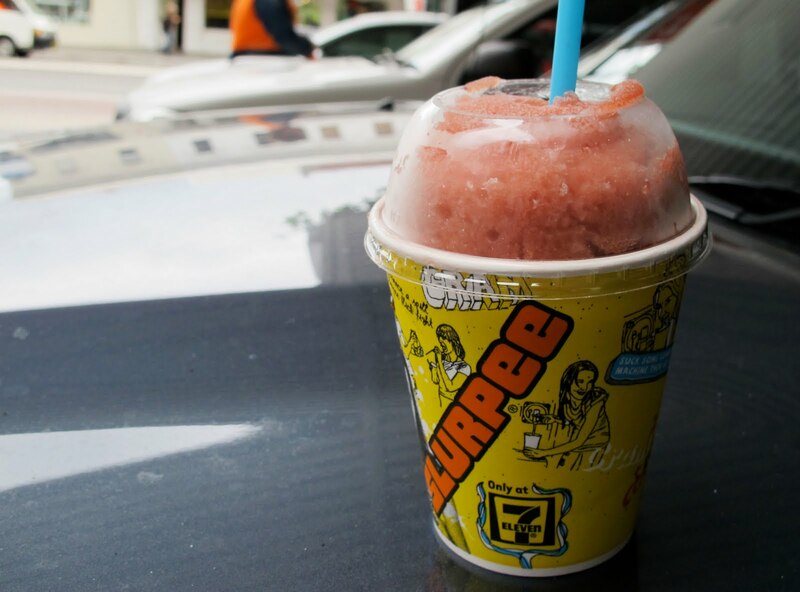 One of the best things in Australia are 7Elevens and THE BEST thing about 7Elevens are slurpees! But on a VERY special day they can come like this! This special day is Bring Your Own Cup Day! On September 22nd, 7Elevens allow customers to bring and fill up their own vessel with as much sugary, fizzy goodness as it can contain! 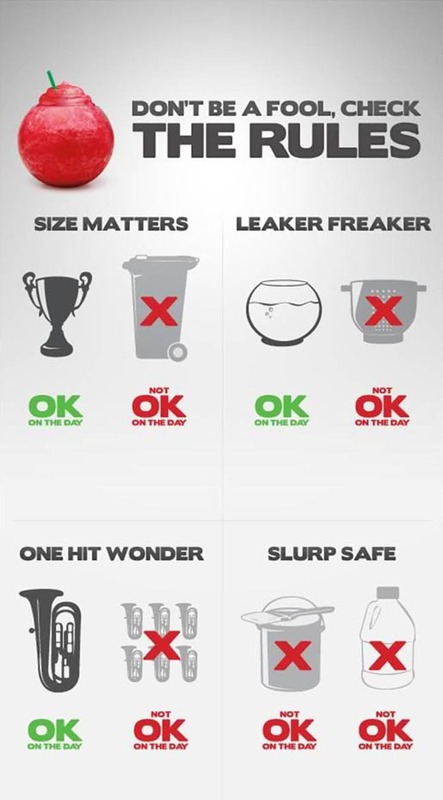 With the rules in mind that morning I went hunting to find my own perfect slurpee container! I really wanted to go with a waist-high, glass vase – perfect for slurpee flavour layering! But after some thought I realised that that was impractical – how was I ever going to drink 3 feet of slurpee before it melted? And it was expensive – 10 bucks. Instead I opted for that seaside classic – the bucket and spade, a mere 3 dollars, a more practical (drinkable) size, I could later take it to the beach and it had a handy handle to boot! I met up with awesome Melbournians Monica and Ash, who brought with them their very own glass elephant vase to fill up! Which we all agreed was very good for appreciating the slurpee layers. The bucket of slurpee lasted a good few hours before it melted. Long enough for me to get some help, mainly from Sarah, to finish it. 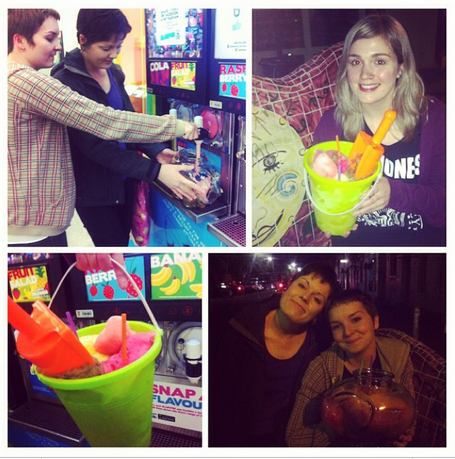 We called it quits at 11.45pm with an estimated 1.5 inches of slurpee left… a good effort. 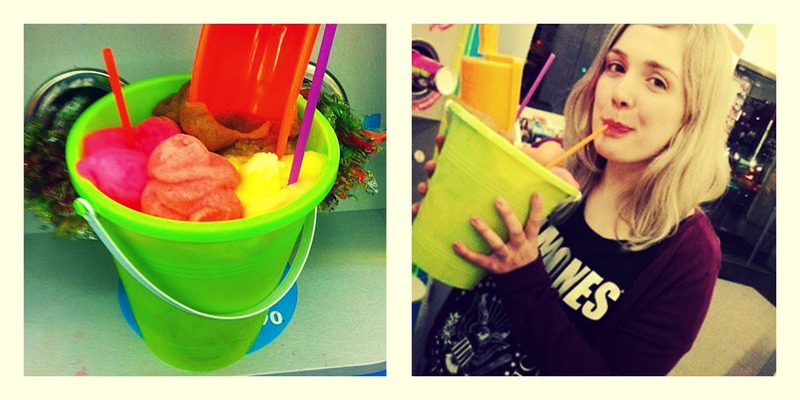 My first Bring Your Own Cup day and my first time drinking slurpee out of a bucket! 3 New things completed! Next 4/26 New Things Challenge: Watch an AFL Grand Final!